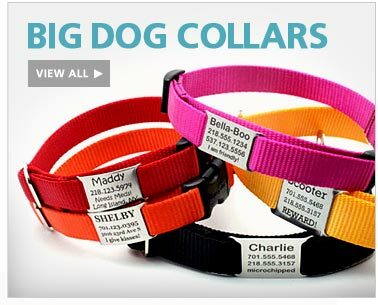 Dog collars, leashes, harnesses in great new styles for small and large dogs. Designer dog training collar of hand sewn nylon webbing and grosgrain ribbon. Martingales with a chain offer quick correction and are an alternative to traditional chain-slip collars. Designer training collar encircled with a ribbon of orange fish hand sewn on nylon webbing. Designer martingale chain training collar with a patterned ribbon of black and white spirals on blue.